Hope you all had a great weekend. We had some fun visiting with friends, trying out a new recipe and crafting. Lots of gray skies this weekend so it was perfect for hanging out in my studio/library. 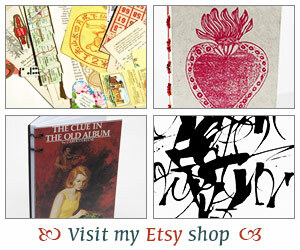 I turned on some music and worked in various journals and even journals for my Etsy shop. It’s been a while since I did some bookbinding and it was great to get back into it. 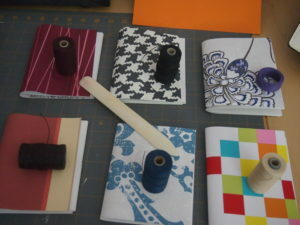 Cutting up paper, sewing and using my bookbinding press. I’m trying to take inventory of all my projects in progress and now that I have some extra time as I’m still job hunting, maybe I can finish some of those journals that have been lingering for months. And, not only that but I decided to start a new journal – a junk journal. What’s that you ask? Well, it’s a journal with a mix of papers. They could be left-overs from painting projects, ripped pages, maps, everything. I think for anyone who is afraid of a blank page, these types of journals can be very freeing. You already have a background ready for you and then you add upon it. To make my junk journal I had the skeleton of a book I used. I had previously taken out all the pages as I needed those for another project. 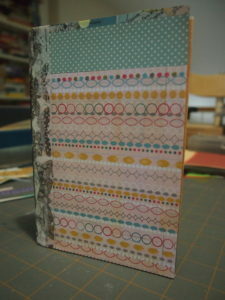 For the book covers I used pretty scrapbook papers and adhered those to the front. I used some washi tape on the spine thinking that would look cute. 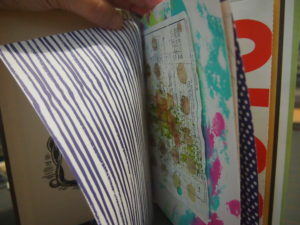 Unfortunately I used some tape from the Tim Holtz collection and while it’s really pretty, it does not adhere very well. I tried to use some Collage Pauge over it but it still managed to lift up quite a bit. What I probably should have used was just some clear gel medium. Anyway, this was my prototype so I didn’t care too much. I just wanted to create something so I could try out the end result and see how I can make it better next time around. For the inside, I only used one signature of 20 pages, which gives you 40 pages. Again, not all are the same size but I think the inside came out really well. I used a simple three hole pamphlet stitch, some waxed linen thread and it was done. I could have added a whole other signature and made it chunkier but again, this is just a trial. This photo shows you a bit of some of the random pages inside. I used some vintage maps, gelli prints, vintage papers, cards, and scrapbook papers. This part was actually the hardest – deciding which pieces of papers I wanted to use. I really enjoyed making this and would like to try working on more of these junk journals but I have a favor to ask, do you think you would use a junk journal? What would keep you from using one? Or if you were to use one is there something specific you would like to see? Tomorrow I’m off to the craft store because I need to pick up some boards for some other journals I make. I have the paper all cut and ready, I just need the book boards. Alright, I am going to settle down with some reading. I’ll have to tell you more about what I finished and started this weekend but that’s for another post. I would use a junk journal for trying out art journaling techniques. Also just to write some haiku, which I haven’t done in awhile. Your bookbinding skills are so cool! I would love to learn how to do that, but I fear all those pretty papers would bankrupt me and then I would never be able to part with the things I make! Sounds like a fun weekend–it is cold and grey here too, which means indoor activities beckon. I like Isabel’s idea of using a junk journal for experimenting! 🙂 I found this <a href="http://thicketworks.com/junk-journal-design-process-overview/"junk journal and thought you might enjoy it. Jenclair – I know right? I think these are perfect for experimenting as they have different papers. Thank you so much for the link. I loved reading about her process and journey into this! I love the idea of the junk journal!